Top Chef Masters: "Trick In A Box"
It's tough being a Chicago celebrity, apparently. Scott has been called away by his media duties tonight — specifically introducing a screening of In The Loop. So he's passed the baton on to me tonight for the final preliminary round. 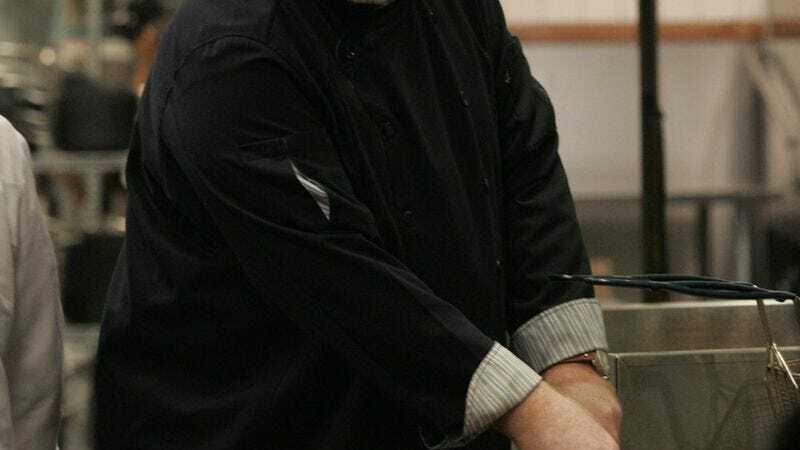 The last chef is about to squeeze his or her way into that Hubert Keller cutout in the finals! Quickfire: We've got a diverse group here — magisterial types, youngsters, seafood, fusion, southern cooking. The challenge is from Season 3, the grocery aisle challenge. The chefs have $20 and have to restrict themselves to the aisles in Whole Foods corresponding to the number on their knives. What's interesting about this challenge is that fresh ingredients, your produce, your cheese, are not found in aisles. You end up with stuff in jars and cans and boxes, stuff that fits on a shelf. Jonathan had international, Art got grains, Michael was stuck in the baking aisle, Roy ended up with Italian. In the now time-honored tradition of Top Chef Masters, the synergy (laid on so thick you can taste it!) was provided by Whole Foods employees who formed the judging panel. Elimination: The chefs each create a "mystery box" for one of their colleagues, who then must use seven of the provided ingredients to make an entree. Will these professionals succumb to the temptation to provide unworkable oddball items? Nah, none of that. Roy gave Art chicken, yams, and sweet corn — right in his wheelhouse. Art responded by giving Roy mahi-mahi. That means Michael got to shop for his idol Jonathan, offering pork chops. But Jonathan threw the tiniest wrench in the works by leaving fish out of Michael's box, a handicap for a man known for his seafood. Culinary students made up the audience for the entrees, in addition to the regular judging panel. Art made a strong southern statement with his fried chicken two ways, and he even made a kind of mango cobbler. It's a lot of food on the plate, and it's delightful to see Gail Simmons digging into fried chicken with her hands. But was he playing too much to his strengths? Roy gave the group beef short ribs and mahi mahi, a festival of protein, but got mixed reviews. Michael offered lamb on a sunchoke puree, and although he ran out of time and didn't get all the plates sauced, the diners passed their plates around so everyone could taste it. No one seemed too ecstatic about the entree. Jonathan made big, messy, saucy plates of pork chop with sausage, puree of celery root, and black truffle. It's a lot of hearty flavors, and everyone appreciates the home cooking feel. So again, no bombs, and no potential drama at critics' table (though on Masters, is there ever?). Michael got critiqued for not bringing his ingredients together, but he did reveal his secret ingredient for the mushrooms: mandarin orange juice! Roy had to hear about overcooked mahi mahi. Jonathan had to defend his choice of plate size and shape. But the group is a love-in, and as they talk about how they inspired and took care of each other, the sweetness is almost goofy, but totally endearing. So Art was the only entree the critics completely loved, but he doesn't have the lead coming from the quickfire. And although Michael had problems, he has the perfect score buoying his efforts. In the end, Art got five stars from the diners and from Gael Greene, and had tears in his eyes as he listened to the accolades. "I never won any culinary medal," he murmurs as the James Beard Award winners congratulate him. What an awesome group of guys. Who needs drama to be entertained on a cooking show? - Things to do before you go on Top Chef: (1) Memorize a dessert recipe. (2) Review how to work a pressure cooker. 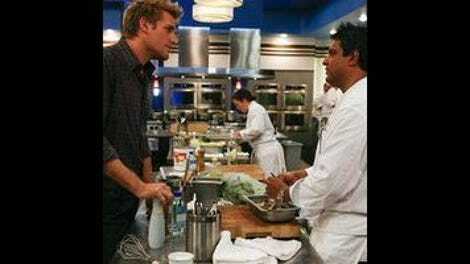 - That meal the chefs made together looked like it might have been a lot of fun if somebody hadn't invited Kelly Choi. - Is this the only preliminary group with no women? - I love how Kelly mentions that everyone will be getting a donation for their charities, but doesn't say the amount. What do you think it is? 25 bucks or so?